Iris butter obtained from iris rhizomes is one of the most luxurious raw materials for perfume industry. The attractive violet-like fragrance is due to irones, i.e. terpenoids formed by oxidative degradation of iridals during rhizome aging. Conventional extraction methods are hydro distillation and solvent extraction, which both exhibit drawbacks such as relatively long process duration with high energy consumption and the use of flammable and toxic solvents like hexane. Therefore, a simple, efficient and mild extraction method with natural, biocompatible and biodegradable soap solutions was developed to receive a product ready to formulate containing the fragrance compounds of iris rhizomes. 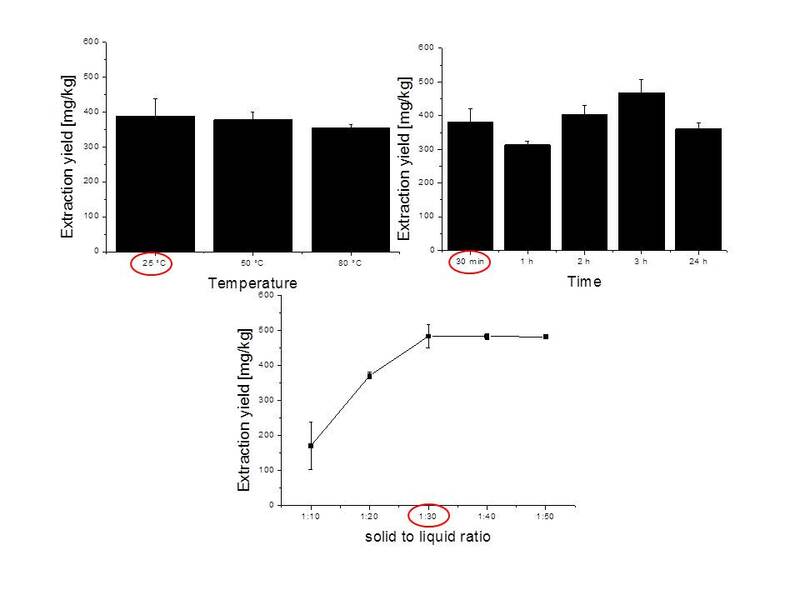 By using aqueous soap solutions, especially a myristate solution, an almost complete extraction of the desired irones was possible within a short time and moderate temperatures. This gentle method prevents the degradation and volatilization of the fragrances at high temperatures, which are disadvantages of conventional extraction methods. Furthermore, it has to be mentioned that various fatty acids, particularly myristic acid, are naturally occurring in the rhizomes. Thus, this extraction method uses an intrinsic plant substance as a highly efficient extraction medium and solubilizer. After the removal of the rhizomes from the aqueous soap solution, myristic acid containing the desired nonpolar fragrance molecules can be precipitated by neutralization and separated from the remaining aqueous phase. Excess myristic acid can be recovered by crystallization in cold ethanol or by molecular distillation. As myristic acid is already a frequent ingredient of formulations like cremes and lotions, the final product with its remaining fatty acid represents an ideal basic raw material for cosmetics.